Music and song are an inseparable part of the Capoeira -these are a few examples of music which tell the story of Capoeira. Music and song are an inseparable part of the Capoeira. The song of Capoeira sets the rhythm and tone of the game, leads the roda, tells a story and directs the players. Capoeira's songs speak eloquently of the country's history of slavery and liberation, racial conflict and cultural integration, economic hardship and spiritual wealth, and articulates the game inside the roda through metaphor and philosophy. A traditional religious song from Candomblé - it focuses on the traditional dances and ceremonies which play a huge part in the religion. In the creation of Capoeira Regional, Mestre Bimba removedmany of Capoeira's original religious rituals and practices. The seven distinctive rhythms of Capoeira Regional are played within this track, can you detect them? Each rhythm was created by Mestre Bimba with a unique message hidden within them only to be communicated to those trained to hear them. A song which bears the roots of samba. 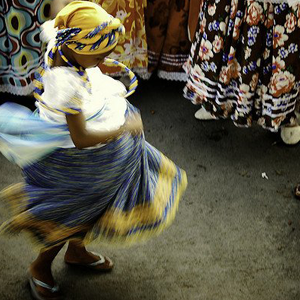 This type of samba (samba de roda) draws from many folkloric dances and traditions of African and Brazilian peoples. The songs chanted here in the traditional African musical form of call-and-response are called, as quadras, and os corridos. Their usage in the roda was established by Mestre Bimba as a way of keeping the energy of the roda full, fast, and powerful. As quadras are the traditional chants that open the roda, while os corridos are the chants that carry the roda. A toque created by Mestre Bimba to mimic that of Capoeira Angola's for his students to be adept at playing with Angoleiros. This rhythm dictates a game that is low, slow, and full of trickery. This song, played to the traditional Regional rhythm, "São Bento Grande", is Ginga Capoeira's anthem. It tells of Ginga Capoeira's origins, celebrates our presence in the world of Capoeira, and calls upon all who support and challenge us.